Directions (1 – 5): A person purchased 6 items of 6 different companies from a shop and sold them online. Given below is the data showing cost price, selling price and profit/loss percentage. As you all know that Railways has released huge number of vacancies this year for Group D, Assistant Loco Pilot (ALP) and Technicians post. General Awareness play an important role for selection in RRB Group D & RRB ALP, Technician Examination that can be solved in less time with more accuracy. We are providing here RRB General Awareness MCQ’s on daily basis. Kidnly do make use of these and prepare well for the examinations. All the best!!! Welcome to Mentor for Bank Exams. NABARD Grade A Recruitment for 2018 is announced and Prelims Exam is scheduled on 12th May 2018. As you know that exam is approaching, you need to be very focused on practice more and more questions to maximize your score. The Economic and Social Issues Section carries 40 marks. For the clear idea of NABARD Prelims Exam, go through this NABARD Economic and Social Issues MCQ’s daily. 1. What is the most important link between Mutual Fund and Investors? Explanation: A Fund Distributor is an individual or a corporation serving as principal underwriter of a mutual fund's shares, buying shares directly from the fund, and reselling them to other investors. 2. What is the rank of India on a ‘Corruption Perception Index’, in a list released by Transparency International? Explanation: India has been ranked at 81st place out of 180 countries on a ‘Corruption Perception Index’, in a list released by Transparency International. India’s ranking is worse than those of China and Bhutan but better than Pakistan & Bangladesh. India's score is 40. New Zealand & Denmark topped the list, while Syria, South Sudan & Somalia are at the bottom with scores of 14, 12 & 9 respectively. 3. What is the difference between GDP and GNP? Explanation: Gross Domestic Product is the value of sum of all final goods and services that are produced in the country. If the income from foreign sources is added to it, it becomes Gross National Product. 4. The Union Cabinet approved the increase in the target for the Pradhan Mantri Ujjwala Yojana, meant to provide LPG connections to rural women, to ________ from the earlier 5 crore, adding that this has to be achieved by 2020. Explanation: The Union Cabinet took a slew of decisions across sectors. The Cabinet also approved the increase in the target for the Pradhan Mantri Ujjwala Yojana, meant to provide LPG connections to rural women, to eight crore from the earlier five crore, adding that this has to be achieved by 2020. It also approved an additional allocation for the scheme of ₹4,800 crore. 5. In which country is the NASDAQ Stock Market headquartered? Explanation: NASDAQ is an American stock exchange headquartered in New York, USA. It was founded on February 4, 1971. It is the second-largest exchange in the world by market capitalization, behind only the New York Stock Exchange. The exchange platform is owned by Nasdaq, Inc., which also owns the Nasdaq Nordic (formerly known as OMX) and Nasdaq Baltic stock market network and several other US stock and options exchanges. Explanation: Except Rupee not, all the other are instruments for making debit-credit transactions. They do not have a fixed value. Rupee note has a fixed value and is used to make monetary transactions. Explanation: Fitch Ratings Inc. is one of the "Big Three credit rating agencies", the other two being Moody's and Standard & Poor's. 8. In which of the following cities, IRDA headquarters are located? Explanation: The Insurance Regulatory and Development Authority of India (IRDAI) is an autonomous, statutory agency tasked with regulating and promoting the insurance and re-insurance industries in India. The agency's headquarters are in Hyderabad, Telangana, where it moved from Delhi in 2001. 9. The World Happiness Report is released by which organisation? Explanation: Finland has overtaken Norway to become the happiest nation on earth, according to the UN's 2018 World Happiness Report. Burundi in East Africa is the unhappiest place in the world. For the first time, the UN also examined the happiness levels of immigrants in each country. The World Happiness Report is an annual publication from the UN Sustainable Development Solutions Network. 10. Which of the following encourages and mobilizes savings of small investors? Explanation: SIDBI provides assistance to small - scale industrial sector in the country. UTI (Unit Trust of India) encourages and mobilizes savings of small investors. Welcome to Mentor for Bank Exams. NABARD Grade A Recruitment for 2018 is announced and Prelims Exam is scheduled on 12th May 2018. As you know that exam is approaching, you need to be very focused on practice more and more questions to maximize your score. 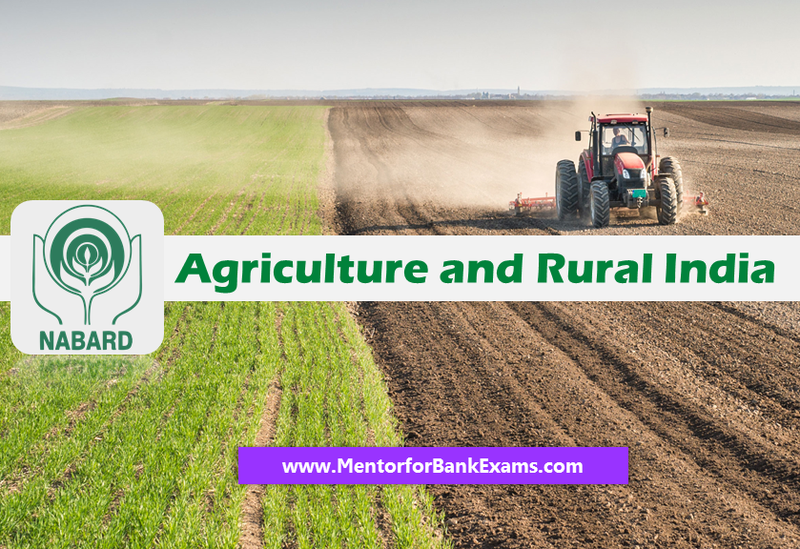 The Agriculture and Rural India MCQ’s Section carries 40 marks. For the clear idea of NABARD Prelims Exam, go through this NABARD Agriculture and Rural India MCQ’s daily. Welcome to Mentor for Bank Exams. NABARD Grade A Recruitment for 2018 is announced and Prelims Exam is scheduled on 12th May 2018. As you know that exam is approaching, you need to be very focused on practice more and more questions to maximize your score. The Agriculture and Rural India Section carries 40 marks. For the clear idea of NABARD Prelims Exam, go through this NABARD Agriculture and Rural India MCQ’s daily. 1. What is the percentage of female workforce in our country as per the 2011 Census? Explanation: The number of female workers stands at 127,220,248 which is 25.5% of total working population. 2. Which state has launched a Ama Gaon, Ama Vikas (Our Village, our development) scheme to reach out to the people in rural areas and involve themselves in the developmental activities? Explanation: Odisha has launched a Ama Gaon, Ama Vikas (Our Village, our development) to reach out to the people in rural areas and involve themselves in the developmental activities. CM flagged off wi-fi enabled mobile video wall vans through which people can send their grievances directly to the CM’s office. With this initiative the administration will solve the the grievances of the people quickly. 3. Which of the following rates is closest to Marginal standing facility rate? 4. Under Union Budget 2018, Government has allocated how much amount for rural infrastructure? Explanation: Arun Jaitley said that the government has allocated ₹14.3 lakh crore to be spent for rural infrastructure. He said every block with more than 50% ST population and at least 20,000 tribal people will have a model residential school by 2022. He added social security will be provided to aged, widows, and orphaned children. 5. An Non-Resident Ordinary Rupee Account for non-resident Indians has a limit of ___. Explanation: An Non-Resident Ordinary Rupee Account has a limit of $1 million. When an Indian national or person of Indian origin residing in India leaves India for a foreign country for taking up employment, business or vocation outside India, or for any other purpose, indicating his intention to say outside India permanently or for an indefinite period, he becomes a person resident outside India. His bank account, if any, in India is designated as an Ordinary Non-resident Account (NRO Account). Explanation: As per the provisional report published during 31st March, 2011, India showed a decadal growth rate of 17.64 % for the entire population as compared to 21.15 % in Census 2001. The report says, during the last decade of 2001 to 2011, population in India grew by 181 million. Explanation: Financial Stability and Development Council (FSDC) is an apex-level body constituted by the government of India. The idea to create such a super regulatory body was first mooted by the Raghuram Rajan Committee in 2008. 8. ____ is a situation in which the inflation rate is persistently high, but demand remains stagnant and unemployment is high. Explanation: Stagflation is a situation in which the inflation rate is persistently high combined with high unemployment and stagnant demand. It's a merger of stagnation and inflation. The economic growth of a country slows due to stagflation. It raises a dilemma for economic policy, since actions designed to lower inflation may exacerbate unemployment, and vice versa. 9. "India Development Update" is released by _________. Explanation: According to the World Bank's "India Development Update", India’s economic growth will accelerate to 7.3% in 2018-19, from 6.7% in 2017-2018. The World Bank said sustaining a growth rate higher than 7.5% will require contributions from all domestic sectors and support from the global economy. The report also highlights several challenges facing the Indian economy that need attention. 10. Name the premier institution that is taking care of the financial needs of importers and exporters of our country which was established in the year 1981. Explanation: Export–Import Bank of India is the premier export finance institution in India, established in 1982 under Export-Import Bank of India Act 1981. Since its inception, Exim Bank of India has been both a catalyst and a key player in the promotion of cross border trade and investment. Here we are providing important questions collection on topic Money Market Instruments that includes Call and Notice Money, Certificate of Deposits, Commercial Papers, Inter-Corporate Deposits, etc. 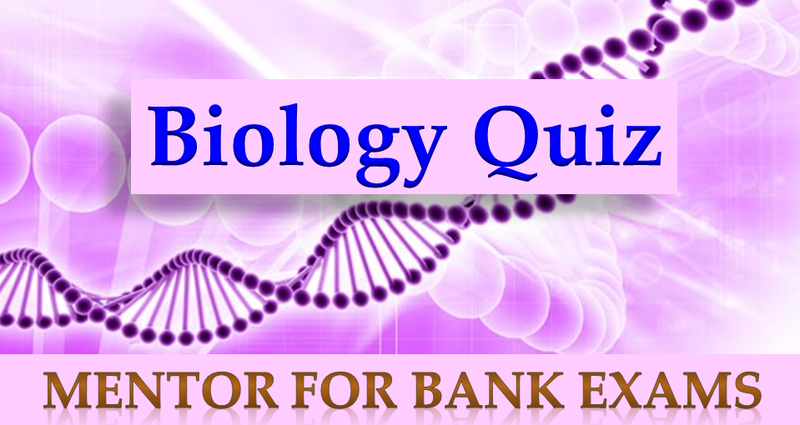 Aspirants those who are preparing for the upcoming bank and insurance exams can make use of these Banking Awareness Quiz. 1. Which of the following country is not a partner country for the Global Investor Summit, Jharkhand? Directions (1 – 5): In the following question, one part of the sentence has a/an error(s). Find out that part. The number of that part is your answer. If the sentence is free from error(s), your answer is (E). 1. Some recent study on panchayats (A) have shown the positive effect (B) of reservation and allocation of (C) resources among the oppressed. (D) No error (E). Directions (1 – 5): Study the following information carefully and answer the given questions below. Eight boxes A, B, C, D, F, G, H and I are placed one above the other but not necessarily in the same order. Each of them has a different colour i.e. Black, Orange, Red, Green, Yellow, Purple, Blue and Brown (not necessarily in the same order). The bottom most box is numbered 1, immediate above box is numbered 2 so on until the topmost box is numbered 8. Directions (1 – 4): The following table is a record of the performance of 12 students in the school team competitions. There are only three prizes i.e.Winner, 1st runner up and 2nd runner up. Winner, 1st runner up and 2nd runner up are awarded 5, 3 and 1 points respectively. Welcome to Mentor for Bank Exams. NABARD Grade A Recruitment for 2018 is announced and Prelims Exam is scheduled on 12th May 2018. As you know that exam is approaching, you need to be very focused on practice more and more questions to maximise your score. The Economic and Social Issues Section carries 40 marks. 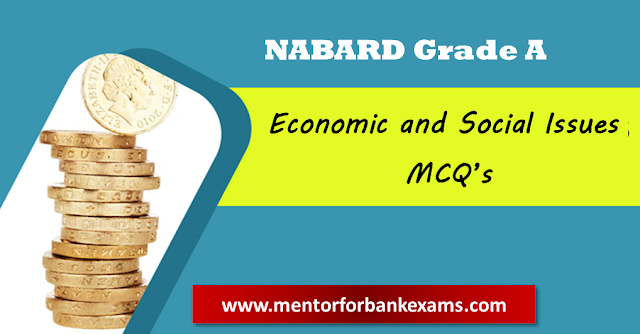 For the clear idea of NABARD Prelims Exam, go through this NABARD Economic and Social Issues MCQ’s daily. Welcome to Mentor for Bank Exams. 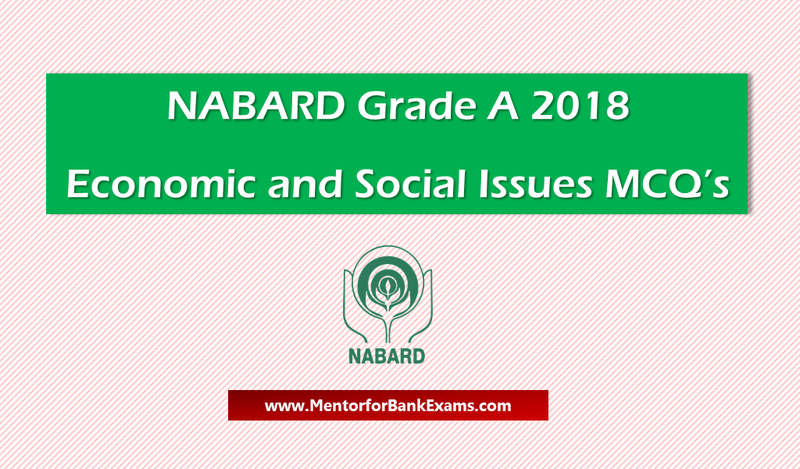 NABARD Grade A Recruitment for 2018 is announced and Prelims Exam is scheduled on 12th May 2018. As you know that exam is approaching, you need to be very focused on practice more and more questions to maximize your score. The Agriculture and Rural India Section carries 40 marks. For the clear idea of NABARD Prelims Exam, go through this NABARD Agricultureand Rural India MCQ’s daily. 1. Which of the following persons was given 2017 Nobel Prize in physics? 1. Phobos and Deimos are the moons of which planet? Welcome to Mentor for Bank Exams. Today here we are providing all the important questions based of Know Your Customer in Banking Awareness Quiz Section. These questions will definitely help you in preparing for the upcoming Bank and Insurance Exams. Welcome to Mentor for Bank Exams. Railway exam will be conducted in the month of April/May 2018 as per the official notification.Here we are giving the important Quantitative Aptitude MCQ’s for upcoming RRB ALP/Technician and RRB Group D in the exam oriented new pattern, these will help you to score good in Quant section. Welcome to Mentor for Bank Exams. 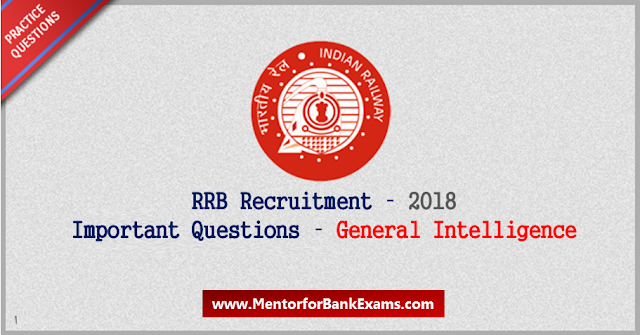 Railway exam will be conducted in the month of April/May 2018 as per the official notification.Here we are giving the important General Intelligence MCQ’s for upcomming RRB ALP/Technician and RRB Group D in the exam oriented new pattern, these will help you to score good in Reasoning section. 1. In Germ line gene therapy, __________. Welcome to Mentor for Bank Exams. Today we are providing the important banking awareness questions based Financial Inclusion, Banking Correspondents, Self Help Groups, Joint Liability Groups. 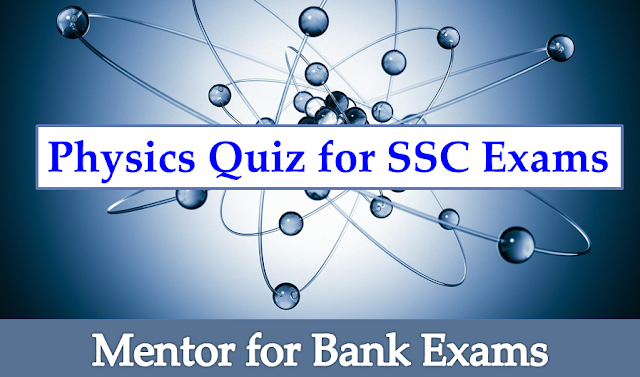 These questions will help you for the upcoming bank and insurance exams. 1. 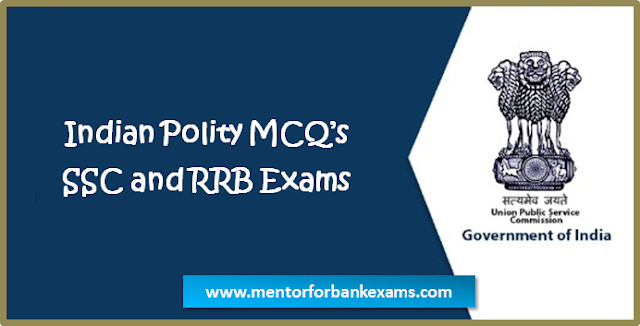 Which of the following efforts fall under Financial Inclusion Plan (FIP) of RBI / government? c) Zero balance accounts, like BSBDA, Jan-Dhan Account, Small Account, etc. 2. Which of the following is not true regarding Financial Inclusion Plan? 5. What is the full form of 'FINO' - a term we see frequently in financial newspapers? 6. Who is a Banking / Business Correspondent Agent (BCA)? 7. Which of the following is true regarding BCA? 8. Which of the followings are eligible as BCA? i) Individuals, like retired bank employees, retired teachers, retired gov) employees, ex-serviceman, etc. 9. Which of the following is true regarding SHG?